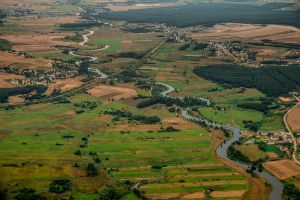 Choosing different crops, building soil organic matter and planting more trees could allow farmers to reduce the risk of nearby rivers from bursting their banks miles downstream, according to an innovative new research project. Researchers in a collaborative project led by the University of Reading will work with farmers, advisors, communities and local authorities across the West Thames area to learn how different land management methods impact on flood risk. The LANDWISE (LAND management in loWland catchments for Integrated flood riSk rEduction) proposal is one of three projects funded under the Natural Environment Research Council (NERC)’s £4m Understanding the Effectiveness of Natural Flood Management (NFM) programme, and will receive £1.25m. A lot of attention recently has been given to ‘slowing the flow’ within river channels using wood to create leaky barriers. LANDWISE aims to look at the wider landscape and investigate ways to reduce the volume of water entering river channels in the first place, and to ‘slow the flow’ by enabling water to move slowly below the ground surface. This can be done by increasing the amount of water that can be absorbed by soil and returned to atmosphere through crops and trees, or stored in deep groundwater. These more natural methods, including crop choice, land preparation, building soil organic matter and tree-planting, can reduce the amount of water that runs off the land surface. They improve soil structure to allow more rainwater to infiltrate below ground. Dr Joanna Clark, Associate Professor of Environmental Science at the University of Reading, and project lead, said: “If you think about the land surface as a bucket, then these different land use and management methods can help us to increase the size of that bucket and help to empty it so that it can hold more water when it rains again. This is about making small changes over the large catchment area as a whole, rather than large changes in small areas where flooding occurs. “The views, experience and knowledge of farmers, landowners and communities are often overlooked during research that heavily affects them. The LANDWISE project is built upon the innovative practices that are currently ongoing within the West Thames area. We found there are many farmers who have already made responsible changes to their land management practices that have the potential to reduce flooding, and others could be further incentivised by changes in agricultural policy. The LANDWISE research focuses on the West Thames River Basin area, where around 112,000 properties are thought to be at risk of flooding if rivers burst their banks, almost 10,000 are at risk of groundwater flooding, and many more are in danger of surface water flooding. Work will initially focus on the Loddon, Pang and Upper Thames catchments, before being scaled up to the Thames river basin upstream from Oxford and Maidenhead. The project will explore whether broad scale changes in land use and management could have helped to reduce the severity of flooding events of July 2007 and winter 2013/14. Following the successful NERC funding bid, the team will gather data to test how effective these measures are for small to large flood events and from local to large river basin scale. They will bring together local knowledge on current land management methods, record how they impact water infiltration and storage below ground using field measurement and new satellite technology, and run modelling experiments based on the data collected and local knowledge. A new, easy-to-use, interactive online data visualisation tool will be developed to help everyone in the team evaluate data sources effectively. This work will be supported by workshops and further field visits, working together with farmers, communities and local authorities. The team will aim to find realistic opportunities for future Government policy on land use and management changes after Britain leaves the EU. NFM measures could also improve water quality, biodiversity and sustainable food production. The scientists will also carry out further study into the potential risk of more flooding that could be caused by increased infiltration and storage of water in deep groundwater if it results in higher groundwater levels. NFM projects led by the University of Manchester and the University of Lancaster were also granted NERC funding. NERC’s Understanding the Effectiveness of NFM is a four-year program in which NERC aims to fund the novel environmental science to improve understanding of the suitability and effectiveness of different Natural Flood Management measures for a range of flood risk scenarios. The two other projects funded under this programme are led by the University of Lancaster and University of Manchester. NFM measures have the potential to provide environmentally sensitive approaches to minimising flood risk, reducing flood risk in areas where hard flood defences are not feasible, and to increase the lifespan of existing flood defences. A total of 12 invited full research project submissions were made by UK institutions to NERC’s NFM funding program, before being internationally peer-reviewed and assessed by an independent panel, following an initial outline bid stage.